The market for EURGBP rose in early Friday trading today to the 0.9060 resistance area, however, it reversed sharply, falling more than a hundred pips to close the session at 0.8924, -1.06%. In any other environment one would be drawn to say the Euro was under intense pressure against Sterling as it hovers close to a critical support area. 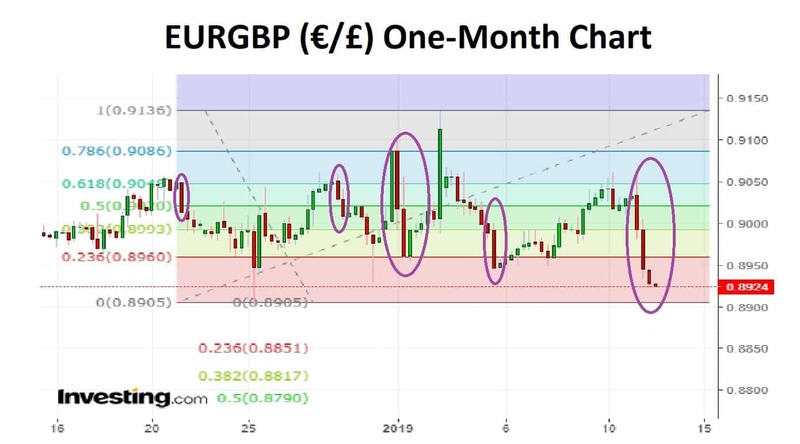 This week is likely to see greater volatility in the EURGBP pair as the Brexit vote, should be held…and probably lost on Tuesday, January 15th, 2019. The key risk to a bullish view for Sterling is that Brexit clarifications drag out after Mrs May’s deal is defeated so limiting any upside appeal that Sterling could have attracted. So, one has to feel that enthusiasm for Sterling will be muted and moderate potential for gains could vaporise in the short-term. 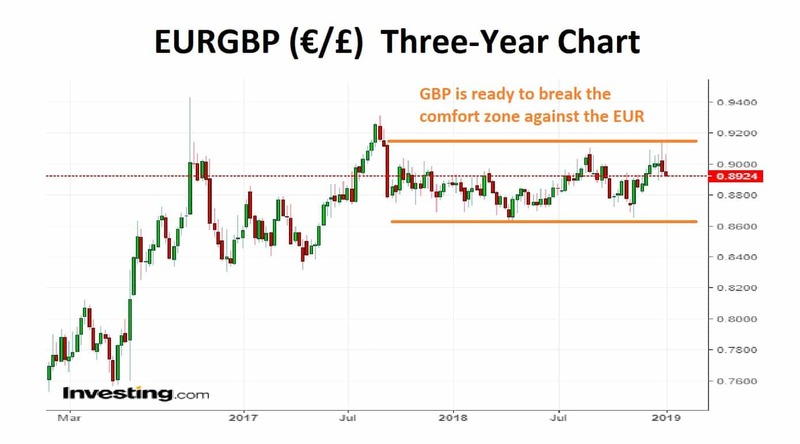 The chart shows that since July 2017 EURGBP has rotated in a flat(ish) channel that has only afforded opportunity to the very shortest of short-term horizon traders. Given the three rejections off the 0.9100 handle in the last five-months, one might expect that level to provide strong resistance for any Euro rally in the coming week and indeed beyond. In an increasingly short-term world, traders would be minded to sell EURGBP if the pair nears 0.910. To break above there will need to be a strong EUR-bullish or GBP-bearish catalyst to provide new lift to the pair above that barrier. This is exactly my fear and I think this week will see an increase in the volume when the “deal” such as it is handed a humbling defeat. Our worry is the for all the recent upheavals in the Eurozone the impact on the UK economy of either a crash out “No-Deal” Brexit, a muddled fudge or a tortuous path toward a second referendum will simply place tremendous pressure on the currency in the short-term so taking EURGBP back to 0.9200. This one-month chart illustrates that rapid declines in the Euro against Sterling are not unique. They do seem to be a pair that dance in a strange concordance. Given the risks for the UK this week…i.e. on the 15th I sense lightening up on Sterling longs is the right policy.